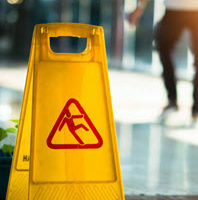 Everyone seems to have a story nowadays about a slip and fall accident, but despite them becoming almost a joke in some circles, they can be very serious and cause significant harm. Pennsylvania law can be difficult to navigate as well, and many cases are decided on technicalities. If you have fallen and injured yourself on someone else’s premises, you should understand that these cases, while very possible to win, can sometimes require more work that one might think they would. While most people have heard the ‘slip at the grocery store’ scenario, there are many different ways that someone can be injured by this kind of scenario. Weather related issues are among the most common, with falls on icy sidewalks and parking lots, wet vestibules and staircases, and the like catching many a person unawares. Lack of tidiness or poor maintenance of the premises is another overarching cause that is very common – if someone trips and falls on, say, a loose extension cord, or a loose tile or floorboard, that is due to the owner or operator’s lack of oversight, rather than any other outside force. Falls of any type, even those that look minor, can be very serious, especially for elderly people. The National Council on Aging (NCOA) reports that falls are the leading cause of death for seniors, with 1 in 4 people over 65 years of age experiencing a fall every year, with approximately 2.8 million injuries resulting which required emergency room care. While obviously, people of any age can experience a serious fall, the elderly are the ones who most often suffer long-term consequences, due to lack of bone density and slower reflexes. A showing that the plaintiff was injured because of the defendant’s actions (or non-actions, such as failing to clean up a dangerous condition from their premises). While many of these can sound straightforward, it can be difficult to establish the last point, especially without witnesses, because otherwise it is generally only the plaintiff’s word against the defendant’s as to how dangerous the condition at issue actually was. Can A Slip & Fall Attorney Help You? Because slip and fall cases can hinge on so many small details, getting an attorney involved is generally a good idea. The Scranton personal injury lawyers at the Needle Law Firm have experience in these cases, and we can sit down with you and try to help you decide what path to take, to ensure that you and your family have the best chance possible to get life back to normal. Call our offices today to schedule an appointment – we serve Scranton, Stroudsburg, and the counties of Northeastern Pennsylvania.